Jeremy, Cameron and Stacey Yankey at Fort Jackson in Columbia, S.C.
Cameron Yankey during the National Anthem prior to an East Clinton High School football game. On the East Clinton High School football roster, Cameron Yankey is listed is a halfback and linebacker. 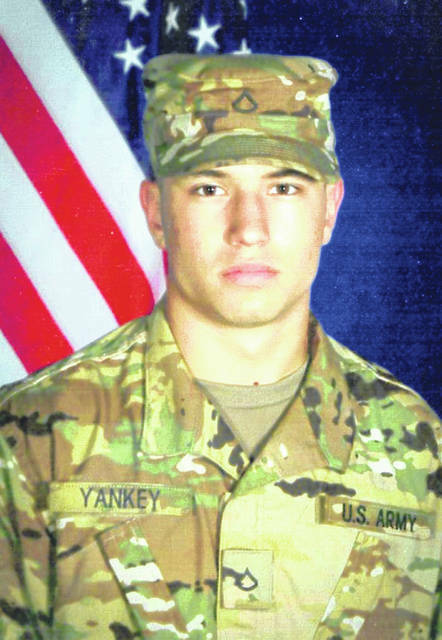 They probably should make room for another position or title — Yankey is a Private First Class in the United States Army. 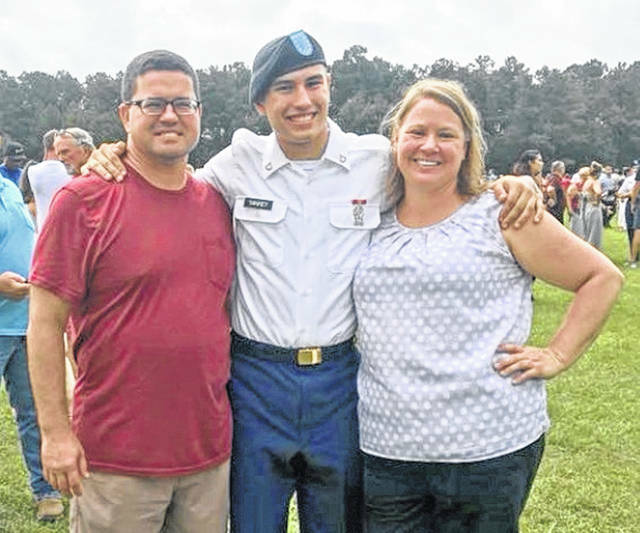 For 10 weeks this summer, while his East Clinton football teammates were going through training under the watchful eye of head coach Jeremy Yankey and his staff, Cameron Yankey, the coach’s son, was going through basic training at Fort Jackson in Columbia, S.C. 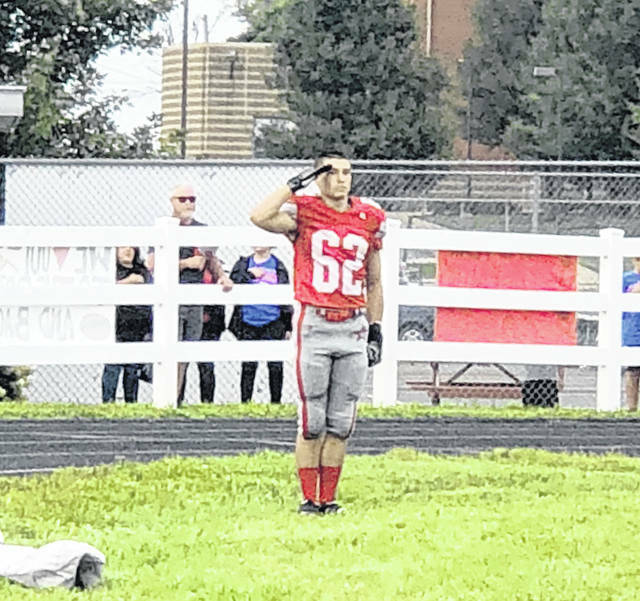 The son of Stacey and Jeremy Yankey, Cameron left for basic training on May 21, three days prior to the end of his junior year at East Clinton. He entered basic training as high schooler Cameron Yankey. He graduated later in the summer as Pfc. Yankey — but as a completely different individual. Cameron’s military interest was primarily sparked by Jeremy’s brother, Neil Arehart. Cameron signed up for the Army National Guard on Dec. 6, 2017. He’s been spending one weekend each month with his unit in Hamilton. One of those weekends followed East Clinton’s season-opening football game against Clinton-Massie. “He was a little sore,” Jeremy said with a smile. Cameron plans to make a career of the military. As it is now, he’s signed up for six years in the Army National Guard, then two years of active duty. Next summer, Cameron will go through AIT, which consists of the remainder of his total basic training period and is where recruits train in the specifics of their chosen fields. Those six to seven weeks will be spent at Fort Sill in Oklahoma. From there, Cameron will complete his time with the Army National Guard one weekend a month until his six years are finished. In the meantime, Cameron will apply his training and focus on East Clinton football. When he returned to the football program in early August, Cameron was welcomed with open arms. “A lot of these kids actually come talk to me about joining (the military),” Cameron said. “They are looking at me more than as a leader (on the football team), but as a life model.